We are always there for the interesting exchanges on the interweb. This time, it was David Ndii exchanging words with NRM General Miguna Miguna. It got a little bit intense. It started when an idle Kenyan questioned the validity of Raila Odinga's engineering papers. DP William Ruto: Raila Odinga is a fake engineer.Not registered anywhere in Kenya.His title doesnt exist. That was not an ACCREDITED university or technical institute in East Germany in the 1960s when Raila purportedly graduated from there. In addition, that school did not have an engineering faculty in the 1960s. Raila must come up with better lies. There are a lot of PROMINENT GERMANS who have had their "diploms" revoked for fraud. It happens even in Germany - prominence or no prominence. The difference here is that I have actually visited @RailaOdinga's former village polytechnic and confirmed it didn't give him a diplom. But you do have a fertile imagination. You claim in your latest book to have been with Raila in Riverside with graphic details on Nov 12 while I and others were with him at his house from 7 a.m and another venue in Karen before proceeding to Panari. Let us lead by example. Raila Odinga was incompetent as the MP for Kibera for more than 20 years. He was one of the most incompetent and corrupt Prime Ministers I have known. He presided over a looting spree at the OPM, which I opposed while serving as his Adviser. He betrayed his supporters repeatedly. He supports the #HandChieth con-men who are in bed with those we are fighting against. You are naive to expect him to join us in a revolutionary quest. Give me a break. We disagreed about your idea of swearing Raila in Dar and Congo. You tried to record a Besigye style swearing in at Wanjigi’s house. Failed. You were not part of planning the 30th event. Did you have a brief deflate the swearing in, or its just incompetence? The swearing-in was intended to TRIGGER the revolutionary moment and energies of Kenyans. On the other hand, the People's Assembly was a talk-shop with no concrete end-game. It was going to end with some poetic declarations and nothing more. You cowardly opposed the revolution. Aish. 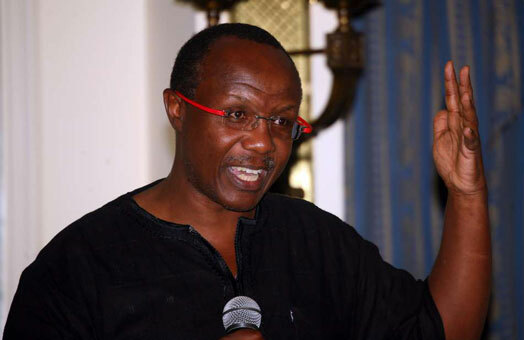 You should join hands with @DavidNdii and the rest of Kenyans to fight this war to liberation. Together we shall prosper. You cannot win the war as an individual. I thought we are agreed I no revolutionary, why you appealing to me? You opportunistically jumped onto our protest after failed run for office and voting for Kenyatta. You got your 15 mins of fame. Now, Mr. Che Guevera take that and your NIS bots and head for the hills. And it went on and on..